With New Analysis Feature: Search strategy detection. With the Water Maze Plug-In, an extension for our three-point video tracking software Viewer, you can set up a high throughput system that does all calculations and statistics of the water maze relevant parameters for you. Even for inter-group statistics you don’t need another program because everything can be done in the plug in. The following description provides a overview how the Water Maze Plug-In can improve your productivity. There are several user defined thresholds for water maze specific parameters in the plug-in configuration. The following paragraphs describe how you can bias the system to measure in the way you like to. 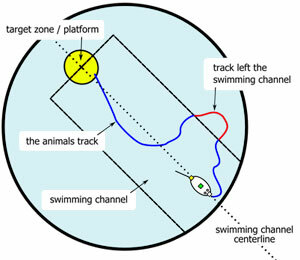 The software can score an animal’s trial as direct swim or not. Therefore the swimming channel is used. It is a rectangular form the software places automatically between the animal release point and the center of the platform. The channel’s length and orientation is determined automatically by the Water Maze Plug-In. Its width is defined by the user. 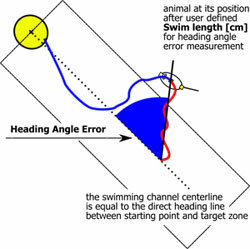 Example: if the width of the channel was 20 cm, the animal’s track would be regarded as direct swim as long as it does not deviates more than 10 cm to the left or 10 cm to the right from the swimming channel centerline. In the sketch on the right the mouse exits the direct swim channel. The second generic parameter is the Heading Angle Error. It is defined as the amount of misalignment between the animal’s orientation at a certain point of the track and the direct path from the animal to the center of the platform at the starting point. Generally the mouse is positioned facing the rim of the basin at the beginning of a test. It has to turn around to head for the platform. As it makes no sense to measure the heading angle before the animal turned around, you can define a certain track length (Swim length) that has to be recorded before the software measures the Heading Angle Error. Accordingly, you can be sure not to measure the animal’s first rotation and receive false angle data, respectively. If applied, the optional automatic BIOBSERVE Neptune Platform can be remote controled by the plug-in. It is installed in experiments that make use of a temporarily submerged target platform. The clear acrylic glass platform can be lowered or extended. It works without electric devices or cables in the pool. The point in time when an animal leaves or enters a zone can be logged in different ways with the Viewer. As experimental setups and scientific objectives vary, it is up to you to decide which of the three tracked points (head, body, tail) refers to the zone statistics. For the target zone there are additional setup features. You can exactly define the occasion that triggers target zone latency measurement. Using only the head point will produce a latency that covers the time between experiment start and the head points target zone entry. Assumed your mice don’t swim backwards, this should be the first tracking point entering the zone. If you consider the platform as detected not until the animal stands on it with all four paws, you should check all three tracking points. In case the animal doesn’t find the target, the plug in can set the target latency either to zero or to experiment duration. The Experiment list is a table with experiment results. Each line represents an experiment. The columns contain values for recorded parameters. Experiment lists are saved as single result files, although they are really result pools. You can open several of these pools at the same time and compare them statistically. For each opened file there is one tab sheet (element 2). Single experiments can be deleted or shifted from one result pool to another. The tables are built in six sections. The Swim Performance section is highlighted in the screen shot above (element 1). All sections are described in the table below. The software automatically calculates mean values and standard deviations for all parameter. Averaged over all experiments. You can exclude experiments from statistical computation. For example to check how results would look like without outliers. The statistics updated automatically. The additional ‘n’ column in the Statistics table (element 1 in the screenshot below) shows the total number of experiments that contributed to the displayed mean values. Under the Statistics table there are two tabs at choice: Single and Group (element 2). These are used to switch between statistics on one result pool (Single) and result pool comparison (Group). When only one result pool is analyzed, the table lines contain mean values (Average, first row), standard deviations (StD, second row) and standard errors (StE, third row) based on all used experiments in the Experiment list. These statistics refer to all currently opened result files. Each result file is represented by a line in the Statistics table (element 1). For group comparison each averaged value represents one Experiment list parameter. Setup: Shows an aspect of the experimental setup with zones – a useful tool for screenshots. Graph: Line and bar charts that refer to the statistics table above. Track: sketches of all zones and tracks of the experiments in the displayed result pool. All parameters results can be displayed in graphs. When the Single statistics table is chosen, graphs refer to the visible Experiment list. When Group statistics is active, there is one bar for each open Experiment list in the bar chart. In this context each result pool (Experiment list) is regarded as one group. The example below shows results for quadrant visits of two groups. The horizontal lines above the bars show the standard deviations (StD) or the standard errors (StE). The Setup tab shows a snapshot of the pool. 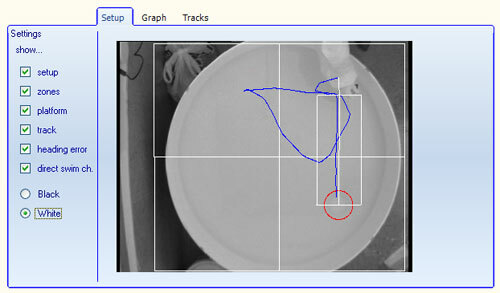 On this picture you can show the quadrants zones, The platform location, the animal’s track, the direct swim corridor and the heading angle error for a selected experiment. By the checkboxes on the left of the picture you can hide or show specific display elements. The Track sketches are thumbnails of the experiments. They can be shown all at once. What do you need for a Water Matze setup? We can provide a turnkey Water Maze maze setup with all required components. Get a quotation.